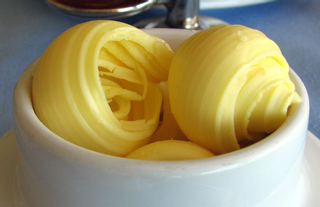 The Butter Museum in Cork, Ireland, features on some lists of the world’s quirky etc. food museums but not others. It ought to be on all of them. This is a seriously interesting museum for anyone who likes butter, and in my book, that means just about everyone. (I refuse absolutely to say anything about the impact – if any – of butter on health, not least because there’s nothing certain one can say.) It sits next to the grand Butter Exchange, built when the Cork Butter Market sat like a colossus astride the global market. The Irish butter traded through Cork was done in by refrigeration, fell to the lowest level possible, and then emerged again after Ireland joined the European Union, by returning to the principles that made the Cork Butter Exchange great. The Butter Museum tells the whole story. This episode tells a bit of it. Regina Sexton is @culinaryireland on Twitter. The Cork Butter Museum really is worth a visit. The banner photograph is my own, and the butter curls are by Dennis Miyashiro, used with permission. I snarfed the music from SoundCloud. I still have no idea how permissions there work.